Salagdoong Beach is one of these places people always visit when coming to Siquijor Island. Why? First of all Salagdoong Beach is widely recommended in any tourist guide, round-the-island trip offers, private blogs and many others. That results of large number of tourists as well as locals you can meet at this place most of the times you come. Weekends are usually far more crowded as that is public beach and popular destination for families living on the island. Second – Salagdoong Beach is not only beach but also resort you can stay overnight or few days in one of the cottage, hotel room or your own tent and enjoy the place and its surroundings. There is nice restaurant offering local and international cuisine, too. 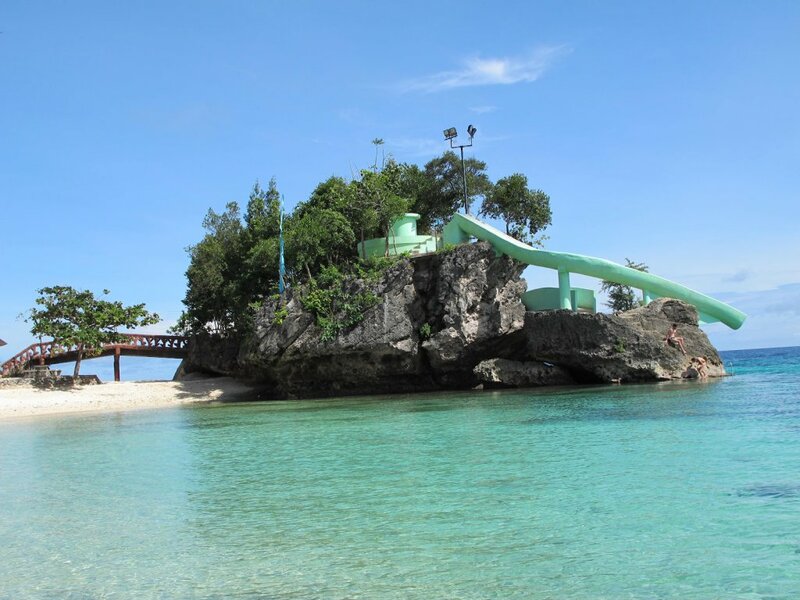 Third – at Salagdoong Beach you can experience one of the most exciting and thrilling attractions on the island – a cliff jumping to the crystal water. 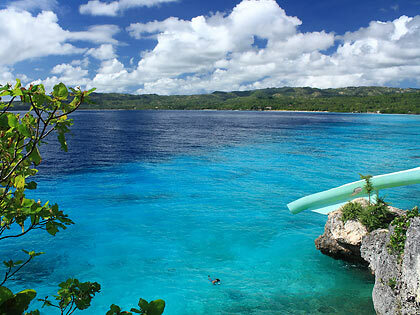 Salagdoong Beach Resort is located near Maria, northeast side of Siquijor island. There is visible sign on the highway where to turn to reach the place. Just after leaving the main road you enter absolutely beautiful Molave Forest. The road through it is amazing and you will miss real beauty if you do not stop at least for a while and take a short walk there. 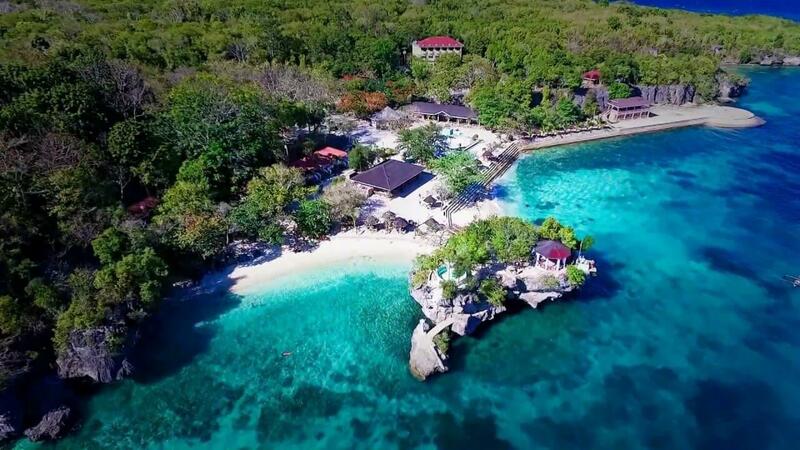 Next you reach the gate where you have to pay entrance fee per person and parking fee which is relatively high comparing island prices and if you come with the company of 3-4, you have to spend quite a lot of money at the very beginning. Just after the gate you get all Salagdoong Beach offers. Beach itself is not sandy, it is rather like most of the beaches on this side of the island – a little bit rocky and made up of small white dead corals and shells. That is nothing bad of course especially the water here is crystal blue and most of the time very calm. Perfect spot to swim and relax. It is possible to rent a kayak, too. There are also numbers of picnic tables available, so you can bring your own food and enjoy the time with friends or family. As mentioned before Salagdoong Beach is famous for its real attraction, which brings lots of people here. All of those, who love jumping to the water, as well as those who wants to break own barriers. There are two concrete platforms, one about 7 meters, second one about 10 meters high. Not so high you may say. Well, try to place yourself at the edge of one of these platforms and jump down to the water. The water in Salagdoong is very inviting but many people just go up, look around and down, take picture and escape J However those who are brave enough speak with one voice: this is extraordinary experience! Jumping is possible during high tide only, so if you plan visiting Salagdoong Beach and are eager of dive jumping, you have to check tide forecast carefully. People either like Salagdoong Beach and call it best beach on the island or avoid it and choose other, more wild ones with less people. Whatever you like, it is worth to go there, as everybody may find something special for oneself at this place.